From working to homeschooling to parenting, the life of this momma can get pretty busy. (Just like all moms, right?) When we’re juggling all the aspects of our lives, it’s easy to just forget all about meal planning! That’s where cooking with a crockpot can be a HUGE help. When I cook with my slow cooker, I have a much easier time getting dinner on the table – on time! 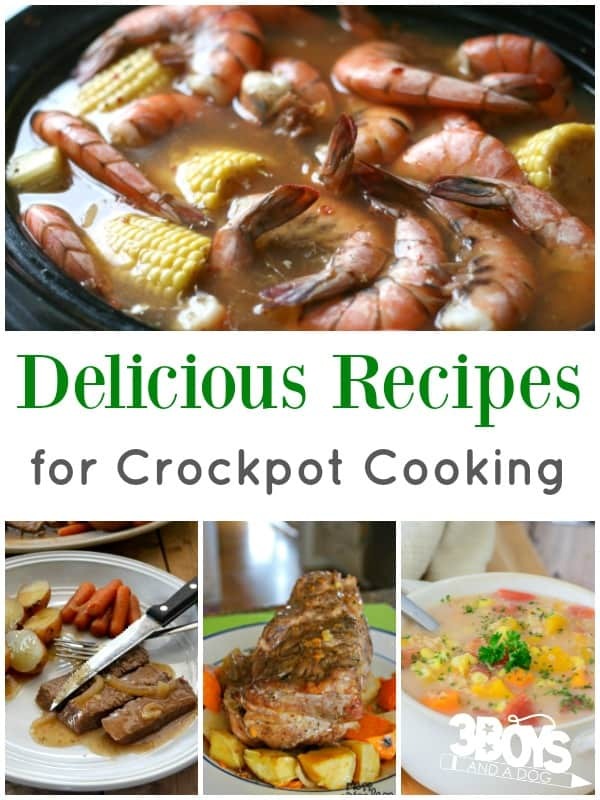 Today I’m sharing some of my favorite crockpot cooking recipes with all of you! There are dinners, breakfasts, and even slow cooker desserts to choose from below! 1. This Slow Cooker Seven Layer Dip makes a wonderful appetizer or finger food for a party! 2. Make this Slow Cooker Pork Roast for a warm, comforting family dinner! 3. These Pulled Pork Tacos would be awesome for Taco Night! 4. In the mood for Chinese food? This Slow Cooker Sesame Chicken will do the trick! 5. Get the kids to try a vegetarian meal with these Slow Cooker Lentil Sloppy Joes! 6. Tired of your slow cooker drying out your meatloaf? Learn the secret to making Crock Pot Moist Meatloaf! 7. Make an old standard with this Crock Pot London Broil! 8. Chili mac is yummy, but it’s terribly unhealthy. Try this Slow Cooker Healthy Chili Mac for a lighter version! 9. Make this Crock Pot Lemon Artichoke Chicken for a light dinner! 10. This Slow Cooker Maple BBQ Chicken with Pineapple would be delicious over rice or mashed potatoes! 11. I grew up eating Low Country Boil. After watching my family slave over a stockpot, this Crockpot Low Country Boil looks easy-peasy! 12. These Slow Cooker Sriracha Meatballs would be awesome on a meatball sub or as appetizers! 13. If you love hearty dishes, this Paleo Slow Cooker Braciole is definitely filling! 14. Pork and sweet potatoes make a wonderful autumn dinner. Try these Slow Cooker Pork Chops with Sweet Potatoes this fall! 15. Serve this Slow Cooker Veggie and Quinoa Chowder with buttery dinner rolls! 16. This Crockpot Veggie Lasagna cooks up large enough for a big family to enjoy! 17. This Slow Cooker Chex Mix would be an excellent party favor! 18. Cook this Slow Cooker Spiced Whole Chicken and use the meat for tacos, burritos, or chicken sandwiches! 19. Add a green salad and a loaf of French bread to this Crock Pot Baked Ziti for a complete meal! 20. These Slow Cooker Chicken Nacho Taquitos would make a great cook and freeze snack for kids! 21. Take the work out of lasagna with this Slow Cooker Roasted Vegetable Lasagna! 22. Craving something sweet? Make up a batch of this Slow Cooker Peanut Butter Hot Chocolate! 23. If you love spicy food, these Slow Cooker Jalapeno Popper Chicken Sandwiches will be right up your alley! 24. Ever had taco soup? Try this Chicken Enchilada Soup for another Tex-Mex variation! 25. Make this Pineapple Chicken Curry in your crockpot and serve it over jasmine rice! 26. If your kids don’t like eating beans, try this recipe for Slow Cooker Pinto Beans. They’ll love it! 27. This Slow Cooker Chicken Chili cooks enough to have leftovers the next evening! 28. Did you know you can cook steak in your crockpot? Try this slow cooker Steak and Caramelized Onions! 29. This Slow Cooker Chicken and Cheese is really easy and kid-friendly to boot! 30. Put this Crockpot Oatmeal on overnight and have breakfast ready to go when everyone wakes up! 31. Make this Slow Cooker Pot Roast for a tender meat main dish that you can serve with potatoes and carrots! 32. Spaghetti squash can be a really difficult vegetable to cook. Prepare this Crockpot Spaghetti Squash, though, looks super simple! 33. Make this elegant 12-Layer Lasagna in your slow cooker! 34. These Crock Pot Stuffed Cabbage Rolls look amazing! 35. Serve a hot breakfast to your family with this slow cooker Smoked Sausage Hash Brown Casserole! 36. Make a batch of these Blueberry Cinnamon Rolls in your crockpot for breakfast or dessert! 37. This Creamy Sun-Dried Tomato Chicken would be delicious served with angel-hair pasta! 38. Looking for a rich dessert to serve on cool evenings? Try this Caramel Apple Crumble! 39. Cook a whole bird the easy way with this Slow Cooker Whole Fryer Chicken! 40. Make a batch of this Slow Cooker Pumpkin Spice Latte drink and serve it to guests this fall! 41. Burritos make a mess when eaten by little hands. 🙂 These Slow Cooker Chicken Burrito Bowls offer the same taste without the mess! Use these supplies to make crockpot cooking fast and easy! 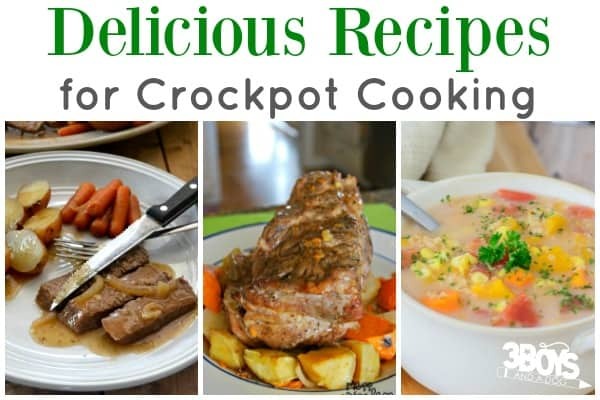 Thanks for including my Crock Pot London Broil recipe! 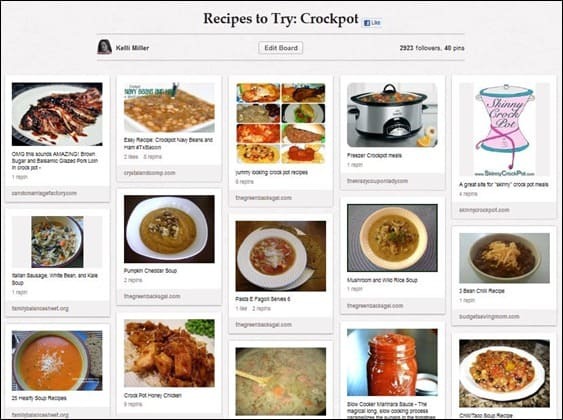 I love to use my crockpot – and enjoy looking for different recipes! Thanks!